The acting president of Venezuela, Nicolas Maduro has said it is highly unlikely that the body of the former president Hugo Chavez will be embalmed. Earlier, Mr Maduro had suggested it would be preserved and displayed like Lenin, Ho Chi Minh and Mao Zedong. Mr Maduro said Russian experts thought it would probably not be possible, as the body had not been properly prepared in time and now presented complexities. Meanwhile, the official mourning period has been extended until Friday. After the president's death on 5 March, the government had declared seven days of official mourning. 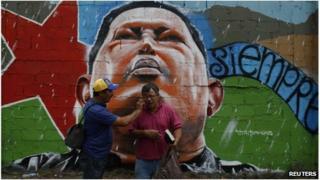 The United Nations general assembly held a minute of silence for Mr Chavez on Wednesday. Mr Maduro, who is running for president in the 14 April elections, commented on the deceased leader's embalming during a speech. "Russian and German scientists have arrived to embalm Chavez and they tell us it's very difficult, because the process should have started earlier, immediately and now it's not possible. We are in the middle of the process, and it's complicated," he told the crowd. Earlier, the acting president said an alleged plot to murder the opposition presidential candidate, Henrique Capriles, had been discovered. Mr Maduro said the government would make sure his opponent received police protection. "(The plan has been) linked to the group of Roger Noriega and Otto Reich in the United States, to make an attempt on the life of the presidential candidate of the opposition." Earlier in the week, Venezuelan officials said they would set up an inquiry to investigate suspicions that President Hugo Chavez was murdered by foreign agencies. Oil Minister Rafael Ramirez told the BBC the United States and Israel were to blame for Mr Chavez's death. He said he hoped the special commission would provide evidence. On an interview with BBC Mundo in Caracas, Mr Ramirez said he had no doubt that Mr Chavez's death was an act of confrontation and similar to Yasser Arafat's. On the day Mr Chavez died, Mr Maduro also likened his case to the death of the Palestinian leader. Venezuelan official rhetoric against the United States has stepped up since the day of Mr Chavez' death. Hours before the official announcement, Mr Maduro said live on state television that a plot to "destabilise Venezuela" had been foiled. Two US military attaches were ordered out, accused of involvement in the alleged conspiracy. On Monday, the US expelled two Venezuelan diplomats following the expulsion of their officials from Caracas. The two countries have not had ambassadors in each other's capitals since 2010.